At her home in the Central African Republic, Djouleyatou Ousman made a decent living buying and selling animals. It put a roof over her family and provided three meals a day. 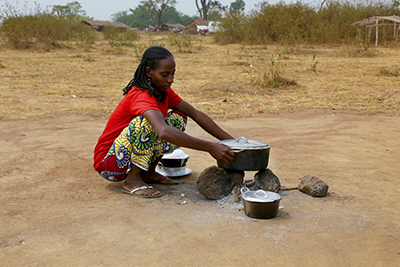 All that changed 3 years ago, when violence in CAR reached her rural community in the east. Djouleyatou and her husband fled with nine relatives, taking only a few animals. For the next 2 months, they walked or ran—day and night—covering hundreds of miles, and facing unspeakable dangers along the way. They ended up in Boubara village in eastern Cameroon. That’s where they met Catholic Relief Services in 2014. We provided critical emergency aid: blankets, mats, mosquito nets and cooking utensils. CRS has distributed household items in eastern Cameroon to almost 6,000 refugees who fled on a perilous journey from violence and civil strife that has plagued CAR for years. Djouleyatou can’t bring herself to describe exactly what she saw and experienced in those last few weeks and days in CAR. It’s not forgotten, just buried for now. Her priority was meeting her family’s basic needs. “We had nothing to start our lives here,” says Djouleyatou. “All of this was given to us,” she says, pointing to the items CRS provided: kitchen pots, a blanket and a mosquito net. Djouleyatou is among 200,000 refugees from CAR who crossed into Cameroon seeking safety. As she settled in Boubara village, she encountered challenges more daunting than furnishing a household. It was the dry season, so the land was parched and animals had nowhere to graze. The livestock Djouleyatou brought all that way would eventually die. CRS and other aid organizations are providing urgent assistance, including food, water and other basics. Food from the United Nations is available in the formal refugee camps, but outside of the camps there is minimal support for refugees. The local communities have welcomed refugees by sharing their land and limited resources, but they are increasingly worried that there isn’t enough to go around. Recognizing that tensions were rising, CRS went to work to help everybody—both refugees and residents. 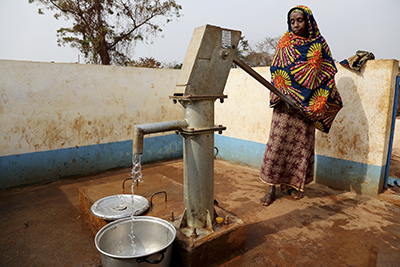 Through a local partner, CODAS/Caritas-Batouri, CRS is constructing dozens of new deep wells so refugees and their host communities have safe and reliable water. This is a big improvement over the shallow wells many have been using, which leave people susceptible to waterborne illnesses like diarrhea, dysentery, typhoid and cholera. Zenabou is a member of a water management committee organized by CRS and CODAS to help ensure the community can operate and maintain the wells, known as boreholes. Every committee includes both refugees and local residents. They learn to promote hygiene and sanitation in their communities. Peacebuilding training also reduces tensions between CAR refugees and host communities. For now, Djouleyatou is afraid she would face harassment by armed groups if she returns home. She no longer has family there, and says life has improved since her family arrived in Cameroon.